ANDRIY.CO - Accounting for the empty and full containers. Accounting for the empty and full containers. 1. Separately beer as the liquid. 2. Glass and kegovuyu container with a liquid (ie beer). 3. An empty glass and kegovuyu packaging (ie, without beer). 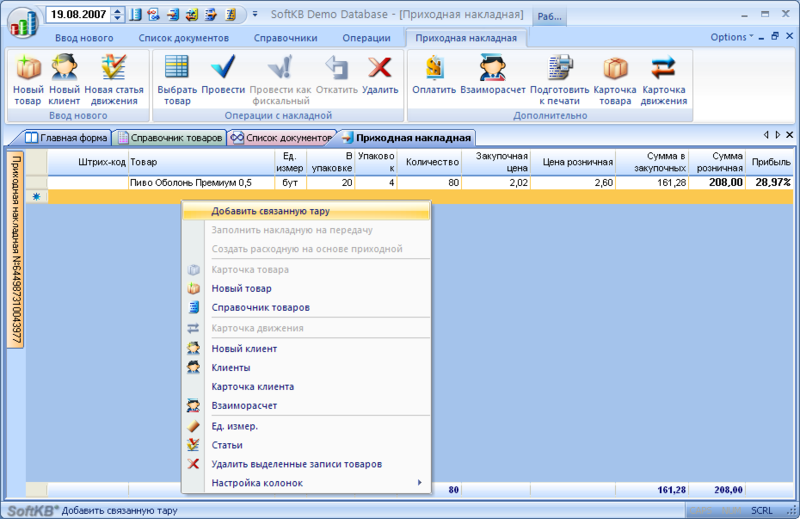 The word «take into account» refers to the full information support for each unit. From whom and when, for whatever price unit was how much of it paid, on a retail price of a unit is sold, who sold to, again, how much it paid for (now paid to us), how much money earned, etc. 1. Introduce products in the directory of an empty bottle. So far as the name, without posting to the warehouse on the invoice. Please note the retail price of beer. It does not include the cost of a bottle. mention now stored in a bottle, my golden liquid. To do this, go to the tab «Weight, volume, packaging» in our cart. 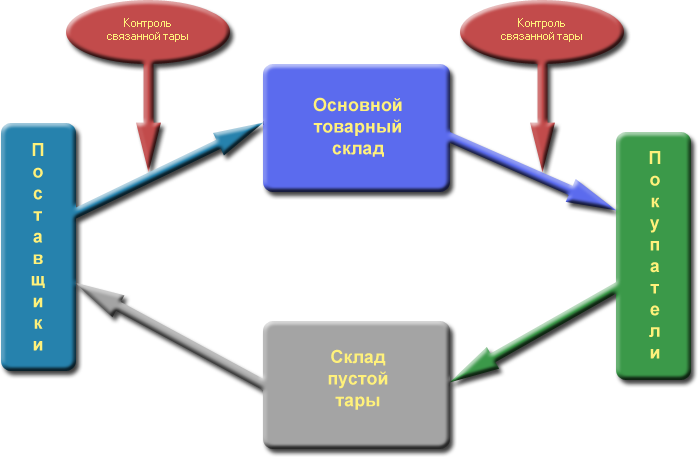 Pay attention to the group of «related packaging». As related tary1 we have chosen «a bottle of beer« Obolon »0,5 l». In addition, we identified a quantitative relationship between the unit «Beer ...» and glass packaging. In this case, this ratio is simple and equal to 1:1, ie one portion of beer accounted for one bottle of beer. Pay attention also to the second related packaging - this box. And for twenty pieces of beer should have a box. Product Number = 20, number of containers = 1. If the selected control the number of containers in the shipment, the invoice will not be able to throttle if it detects a shortage of glass packaging in relation to the liquid. You can not sell 20 to 15 servings of beer bottles. At the same time, we can sell beer and without the boxes, if, for example, the buyer uses their own container. Therefore, the function of control container 2 can be disabled. now proceed to the next stage - how all this works in practice. 1. 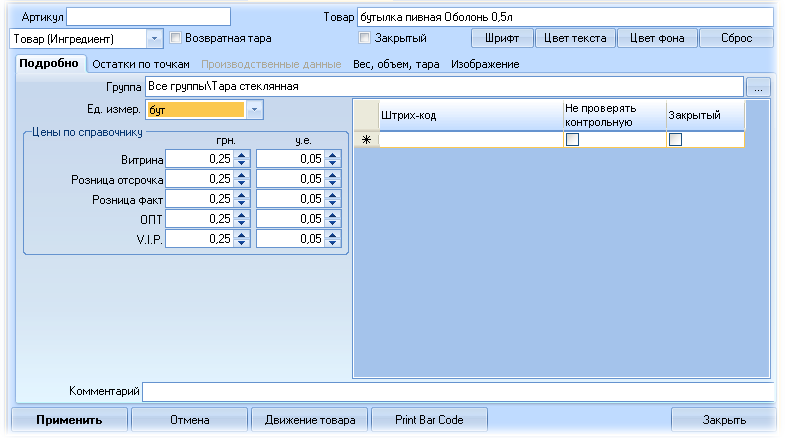 Create a new credit bill (tab «Enter new» -> «receipt note»). Ask the supplier if you want to date and invoice number on the sidebar. 2. 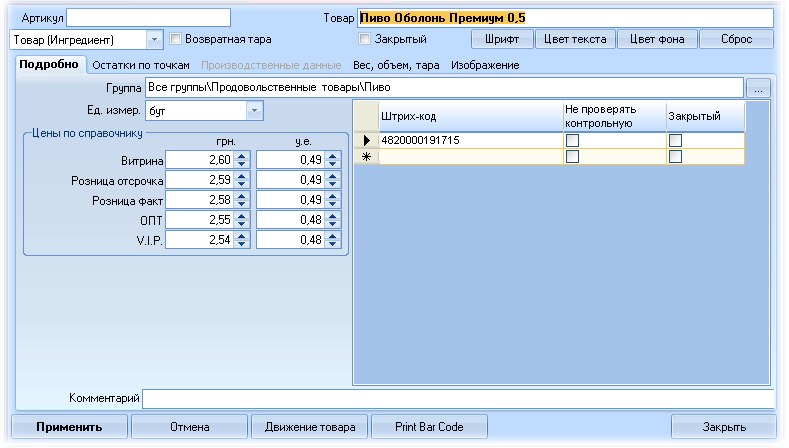 Add our beer «Beer Obolon Premium 0,5» in the credit invoice. Enter the number, the purchase and the retail price. System viewed cartões goods «Beer Obolon Premium 0,5», has been associated packaging and related packaging 1 and 2 in accordance with the ratio of the number added in the credit invoice. What happens if we add yet another product that uses the same packaging-related? It is clear now that our packaging will be missed, since the need for a glass bottle will be 140, a bill introduced in only 80. The situation is similar to the case. We use the context menu item «Add related packaging» again. As we can see TCU2 itself increased the number of bottles and boxes to the minimum necessary. Working with expendable overhead is the same. We select products, related packaging expands in the invoice automatically. Thus, we solve a controversial task. On the one hand we want to maintain the separation of liquids and containers, on the other hand holding tight peg to the product packaging. With a large number of staff at a large load of each worker, in heavy turnover of the human factor plays a decisive role. Errors in manual control packaging is unavoidable and often lead to direct losses. We will not talk about the loss of indirect and moral atmosphere. The function of control of the packaging is now vested in the TCU2. Also automatically calculates the weight and volume. In the cart the goods may be imposed weight and volume for the items sold. Enter the quantity of this product in the consignment note, is automatically calculated weight and volume for each position, as well as on the invoice as a whole. Weight and volume in a particular case can be adjusted for each record the invoice (in this example, the column weight and the amount of the invoice less). Knowing the weight and volume allows optimal use of transportation. is appropriate for those goods that are put in containers to set the volume of only the external packaging that does not sum up the investment volume. For example, if the bottles are shipped in boxes, the volume of the liquid and the bottle should be given a zero.